Fiona MacCarthy gives us a memorable glimpse of Morris through the eyes of the fourteen-year-old Rudyard Kipling, who was a cousin of the Burne-Jones children: ‘Kipling, as a child, was impressed by “Uncle Topsy”, and especially taken with his story-telling facility, giving an account in his memoirs of a surprise visit by Morris to the nursery when Kipling was staying with the Burne-Joneses. “We settled ourselves under the table which we used for a toboggan slide and he, gravely as ever, climbed on to our big rocking horse. There, slowly surging back and forth while the poor beast creaked, he told us a tale full of fascinating horrors, about a man who was condemned to bad dreams. One of them took the shape of a cow’s tail waving from a heap of dried fish”’. However, Morris, had he lived long enough, might well have taken a dim view of much of Kipling’s own literary ‘story-telling’, and I imagine would have approved of the recent actions of students just down the road from me at Manchester University. 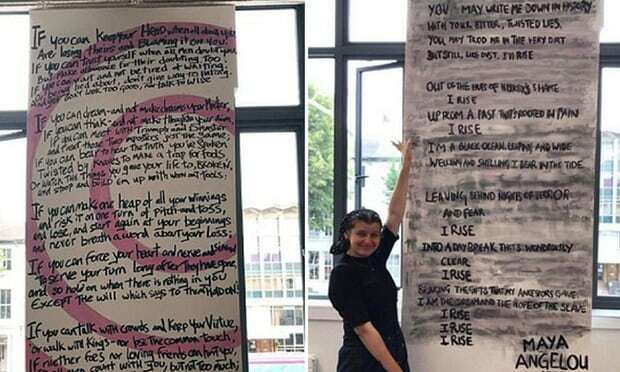 Finding that their Student Union building had been decorated, without consultation, with a mural of Kipling’s famous poem ‘If’, they have painted over it with Maya Angelou’s stirring anti-slavery poem ‘Still I Rise’, on the grounds that Kipling was a jingoist, an imperialist, and dehumanised people of colour. This admirable gesture fits into a pattern of sustained student assault on university icons of Empire, as with the continuing Oxford campaign ‘Rhodes Must Fall’. As one of the foremost anti-imperialist campaigners of late-Victorian England, Morris would wholeheartedly back today’s rebellious students.